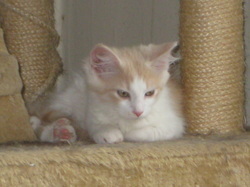 Talisker is a sweet and spunky little guy! He is the most adventurous of his litter...the first to open his eyes, the first to leave the nest, the first into every sort of trouble...he's a pip! He loves snuggling up with his sister Twig, and pouncing on the resident dog's tail.